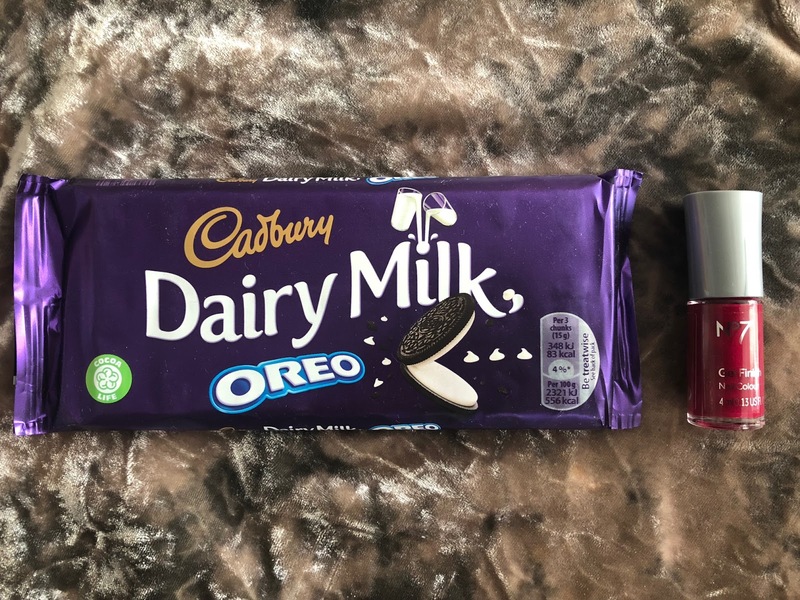 It has become almost a tradition that I host a chocolate stash giveaway during the beginning of advents. Don't know about you, but I'm super excited about it. 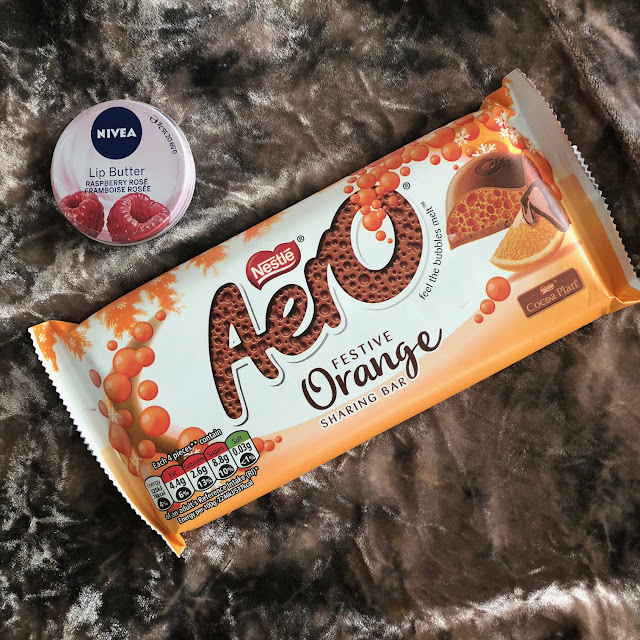 I choose all the different chocolate bars and little bits and bobs to add to the overall prize. In a way, this is the prize I'd be very happy to win myself, so hopefully you will enjoy my giveaway as much as I do. I love reading all the comments. 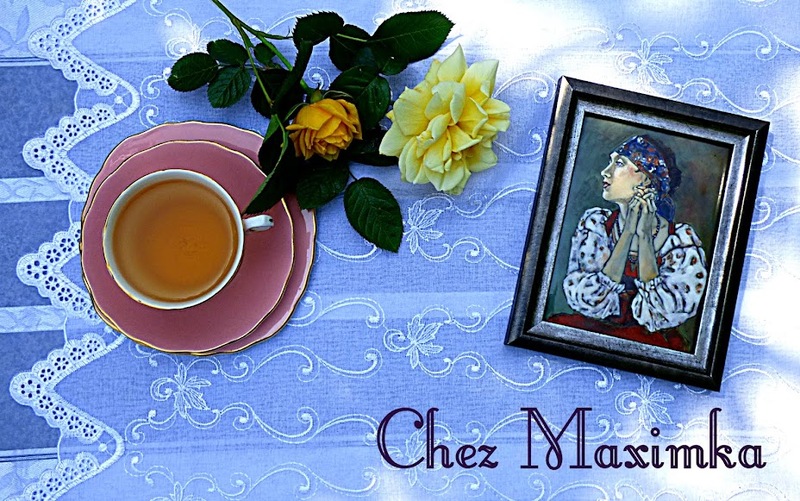 First of all, let me wish all my blog readers a very merry Christmas, and a happy New Year! December is the most anticipated month for many compers, as it brings an avalanche of daily prizes. 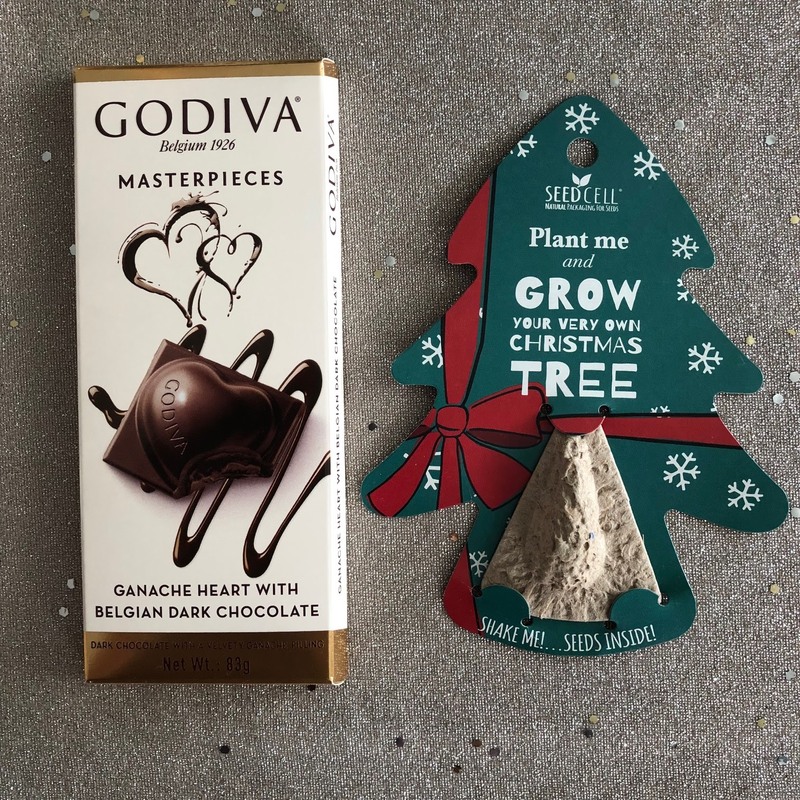 As a self-confessed chocoholic, I do love chocolate gifts, and my seasonal giveaway reflects my love of chocolate. I give you Twelve days of Chocmas. Every day I will offer you a chocolate gift and a little something too, edible or decorative. For 12 days I will be revealing a part of an overall prize, and each day there will be a new question. As stipulated in the T&Cs below, the number of winners will depend on how many questions the first randomly selected winner will answer. If they answered all 12 questions, they get the whole lot. If they choose to answer less questions, they'll get less prizes, and the remaining part of the prize will go to the next randomly selected winner. 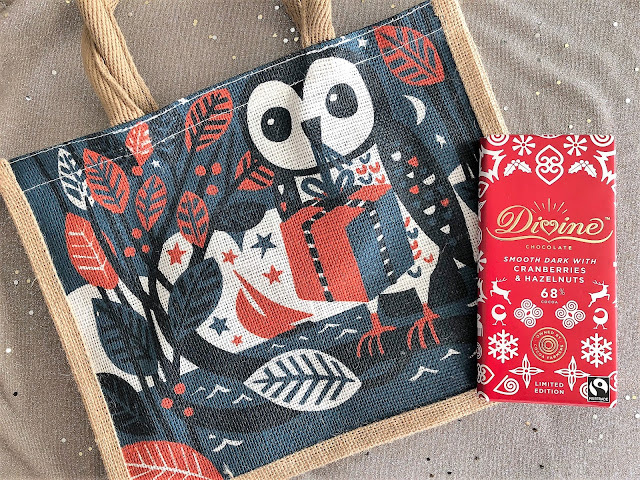 Today's chocolate bar is a festive treat from Divine - Smooth Dark with Cranberries & Hazelnuts + a cute jute tote from Seasalt. Which gift are you most anticipating giving someone this year? 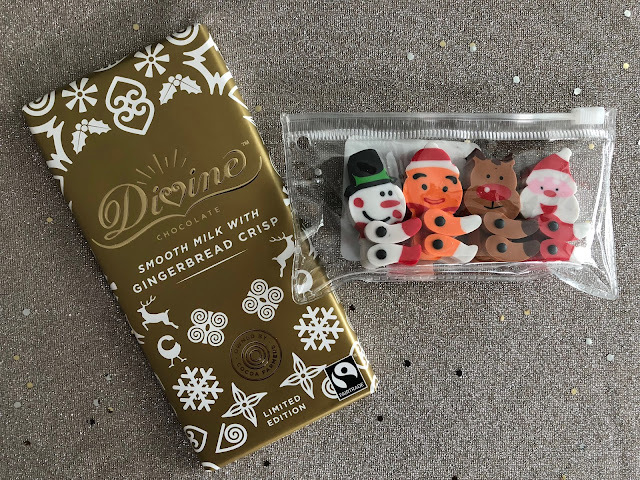 Another Divine chocolate bar - Smooth Milk with Gingerbread Crisp + a set of Christmas-themed erasers. 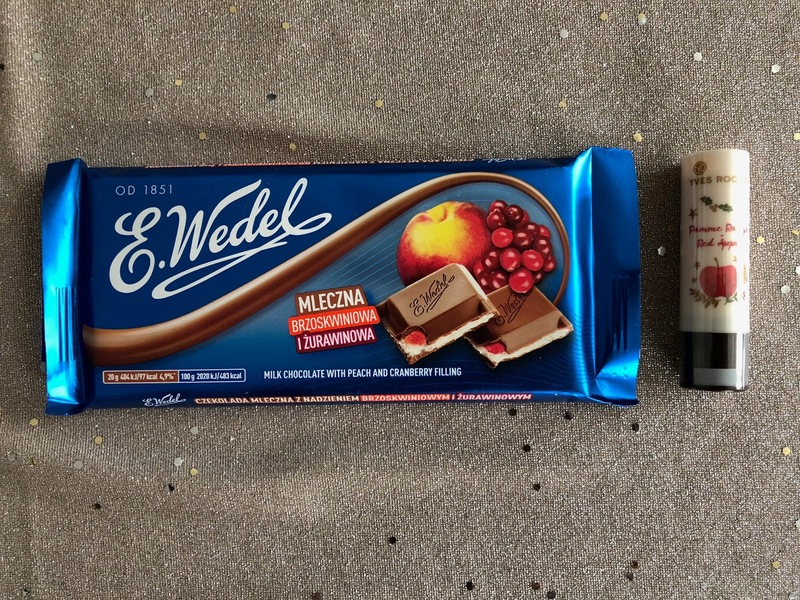 Day 3 (December 3): for me Christmas is not Christmas without a taste of marzipan. So, today's chocolate bar is Ritter Sport Marzipan + a mini Yankee candle Christ,as Eve. What are you going to watch over Christmas - Dr Who, Strictly, Poirot, Call the midwife or something else? I love smooth Godiva chocolate, so for day 4 I'm offering you a Godiva Masterpieces Ganache Heart with Belgian Dark Chocolate bar + a Grow Your Very Own Christmas tree kit which you can buy in Oxfam. Do you have any funny amusing memories related to Christmas? A novelty hot Chilli Chocolate + a bauble filled with truffles. 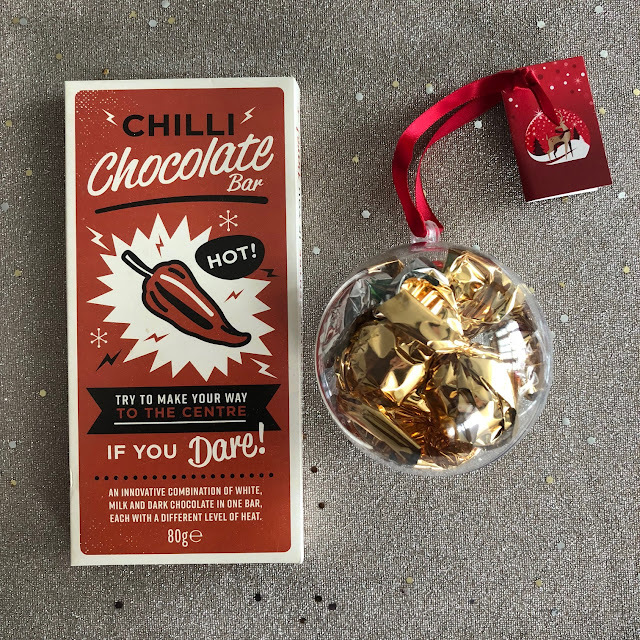 I haven't tried this chilli chocolate, so not sure just how hot it is. Question 5: Please tell me your favourite terrible Christmas cracker joke. Here is mine: Why did nobody bid for Rudolph and Blitzen on eBay? They were two deer. Willie's Cacao Venezuelan Sea Flakes Milk Chocolate + Nuxe Huile Prodigieuse dry oil. I use this oil and love, it leaves skin smooth and smells lovely. Question 6: Christmas jumpers - do you love or loathe them? Will you be wearing one this Christmas? Cadbury Chopped Nut chocolate + 12 days of Christmas gift tags. There is a voting for nation's favourite carol open on Classic FM (vote and you could win a spa break). What carol will you vote for? I'm torn between Gaudete and God rest ye, merry gentlemen (especially performed by Pentatonix). E.Wedel Milk chocolate with peach and cranberry + Yves Rocher red apple moisturising lipstick. Do you ever watch the Queen's speech on Christmas day (is it a tradition in your family, or do you have other things to do)? 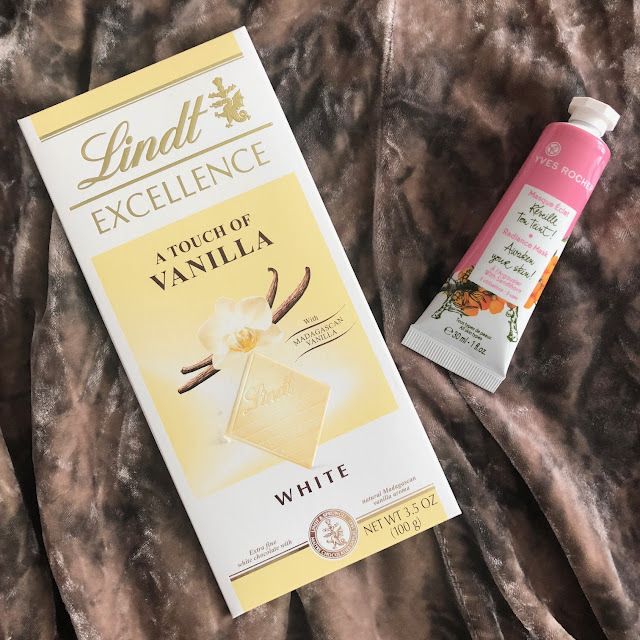 Lindt Excellence a Touch of Vanilla white chocolate bar + Yves Rocher radiance mask. If money was not an issue, and given an opportunity to travel anywhere in the world at Christmas time, would you still opt to spend it at home, or would you prefer to have an exotic location for your celebrations? I sometimes think I'd love to rent a snug little cottage with all mod cons in a seaside village in Cornwall for a holiday week, with views over the sea, or travel to Sweden or Norway. Ours are pretty much the same as in most families - we leave a carrot, a glass of milk and a mince pie (or an Italian pastry when we're in Italy) for Santa and Rudolph on Christmas eve. When Eddie was little, I once removed the pastry away with the little plate, "pretending" Santa has visited us. Eddie ran to the fireplace in the morning and accused Santa of taking the plate. Who is your favourite celebrity chef? And what would you like them to cook for you for Christmas, given a chance? My choice would be between Nigel Slater and Giorgio Locatelli. I don't mind whatever they would choose to cook for me, I'd most likely just sit and admire them. And so we are on the last day of our chocmas, I hope you enjoyed all my questions. 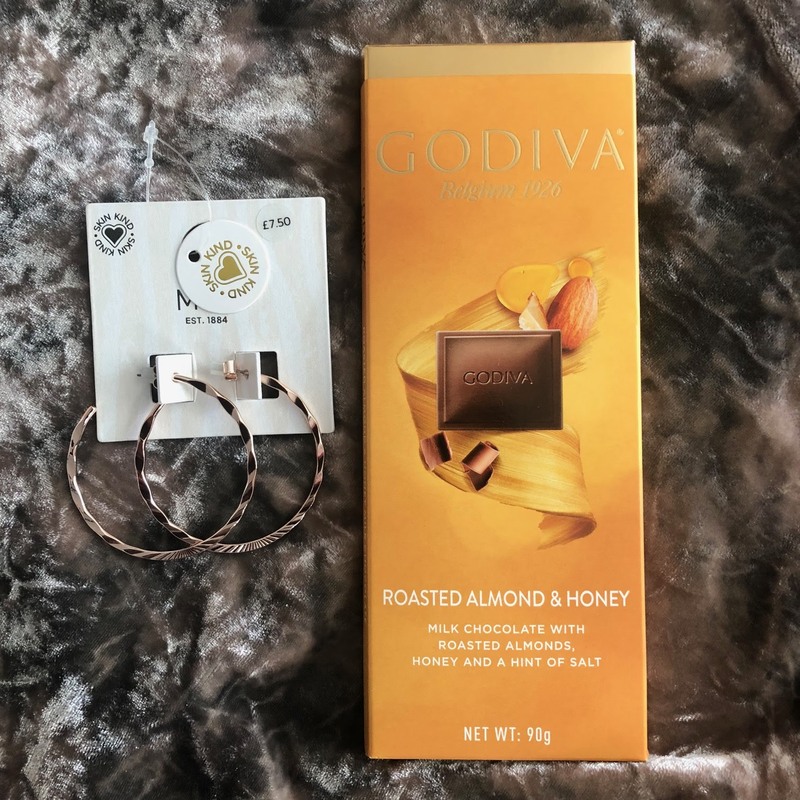 The last chocolate bar is Godiva Roasted Almond and Honey + sparkly M&S ear loops. Not a question as such - just wish a merry Christmas to a poster above you. You might not see comments beyond December 6, please scroll all the way down, and click on Load more, then all the comments will show, and you will see the latest comments. All the comments to this post are being published, please do not worry, and I read every single one of them. The giveaway is open to the UK residents only. Please leave your name or Twitter name in the comment if you login as Anon, or I will never know who commented. There will be one or more winners, who will receive all the goodies appearing during the twelve days of the giveaway. If the first winner has replied to all twelve questions, they will receive the whole lot. If the first winner answered less questions, they will receive the prizes from those days only. The remaining prizes will be allocated to the next winner(s). I hope I don't have to send twelve different packages though. The more questions you answer, the bigger your prize will be. Only one entry per person is allowed (per day). If you missed a day, you will have a chance to catch up on any other day until the end of the giveaway, as long as it comes in a SEPARATE comment. Please note, if you answer 12 questions in one comment, it will count as 1 entry. Once the winner is selected randomly, I will count their replies. I will contact the winner, who will have 7 days to reply with their address details. Due to the nature of the prize which I hope to dispatch in good time before Christmas, the time limit to get back to me is shorter than usual. All the prizes are provided by me, and are in no way sponsored by any brand. 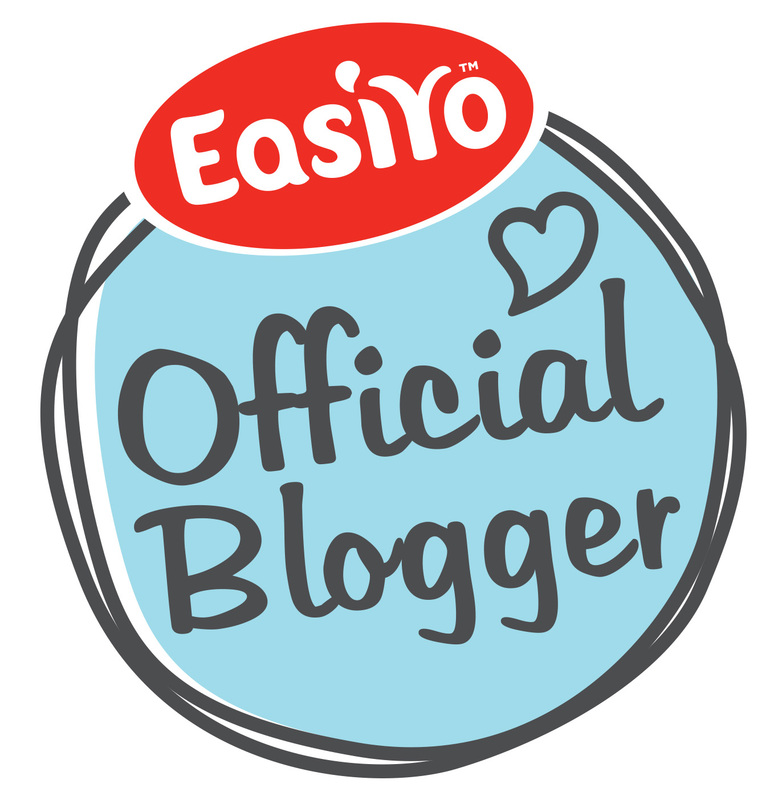 This is my way of saying Thank you to my blog readers. I will be posting the package(s) at my own cost. If the winner's away when the parcel arrives and is not able to rearrange the redelivery, and if by some chance it is returned to me, please do not expect me to cover the cost of the postage again. If that happens, the prize will be taken to the local food bank (foods) and charity shops (non-perishables). I will send the packet by Royal Mail, tracked and to be signed for. The giveaway will end on the 12th of December at midnight. Many thanks to everyone who joined in and entered daily. I enjoyed reading all your comments. The winner has been picked randomly from all the entries. Big round of applause! Well done, Dani, hope you will enjoy all the chocolate! i have some pretty dress up outfits for my daughter i think she will be very excited about! Day 1. The one I'm most excited about I can't share here as I think the intended recipient reads your blog! But I'm also very excited about the subscription to Aquila magazine I've got for my oldest granddaughter, I think she will love it. Day 1 I cannot wait to see my daughter's face when she opens her Sylvanian Families Beechwood Hall! My daughter will be getting tickets to see Panic At The Disco in March. She's mad about them so she's going to be so excited. I'm most excited about giving a go kart to my little nephew this year. Day 1 I can’t wait to see my granddaughters face when she opens her My Little Pony gifts -she’s horse mad!! Day 1 - I can't wait to gift my nephew the Paddington board game that he's b been asking for, for the past 6 months! 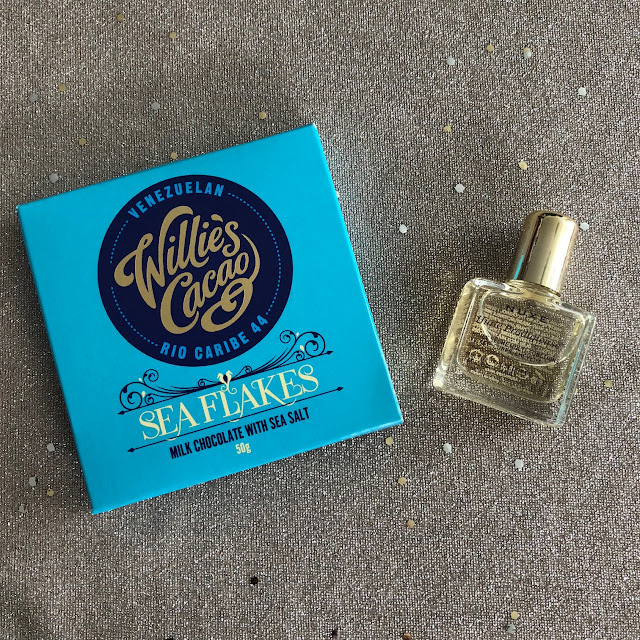 Day 1 - some perfume that my husband really wants. I'm looking forward to giving my wife her surprise present,a surprise to me that is,because she hasn't told me what to buy her yet. Day 1 - I've bought the kids one of the new novelty advents - can't wait for door one later today!! I'm going to order something very unusual for my husband: 4 or 5 small bottles of flavoured syrup made by Monin. He loves them, but finds it hard to get new flavours, but I found a place online that sells all sorts of coffee syrups. I can't wait to see his face when he will open the gift. I got my auntie a seaglass necklace I'm sure she will love and I can't wait to give it to her. I have a lovely cat dressing gown for my niece which she will love. We've got tickets for my son to see the wrestling, he'll be so excited. I'm looking forward to give my son a Chelsea fc scooter. My partner - I got him a Kate Bush boxset. Day 1 - a golf jacket that I've got for my son. I do hope he likes it! Day 1 some fresh x2 heelys for my son. Day 1 - my son is also Harry Potter mad so I can’t wait for him to unwrap a talking sorting hat. My student son is a lot younger than his 3 (half) brothers, hence he has 9 nieces and nephews. I have made him a photo poster featuring them all for his room at university. I think he will love it! Day 2 (I forgot to mention Day 1 yesterday :)) ). I love Christmas cake filled with dried fruits and Christmas pudding (boozy). Before moving to UK I wasn't aware of these two and now I always have them on my Christmas table. Day 1 This year I'm having a handmade Christmas, painting driftwood angels and making fairy jars as well as sewing other items. However, I'm looking forward to giving my friend Joan a William Morris ( fabric ) peg bag as she used to have one and she used it until it was threadbare! Day 2 I love to have a huge fruit platter to choose from. OK, OK so I also have it with meringues, cream and topped with chopped nuts! Day 2 - We call it "black forest trifle" - I make it like a trifle using chocolate swiss roll, cherries, chocolate ganache, cream, more cherries and of course more chocolate. Question 2: What is your favourite Christmas dessert? Mam's homemade trifle! Yule Log is my favourite Christmas Dessert. I'm really looking forward to giving my friend's kids the hoodie bags I've put together for them both - I think they're going to love them! Day 2 - Christmas pudding. My brother has made a lovely one for the last 2 years. Day 2. Its a cross between Christmas pudding and brandy sauce, mince pies and brandy sauce, luxury chocolate and chocolate Yule log cake! I have a sweet tooth! Im buying my mum some concert tickets. She seems really loves a good concert! Day 2. Christmas pudding with thick double cream. Day 2 - mine is trifle - cant beat it! Day 2 - I love having Vienetta at Christmas !! Day 2: I can usually manage a warm home made mince pie (or two) with rum butter and vanilla ice cream melting on it. Day 2 - My favourite Christmas dessert is a Yule log. Day 1 - I'm most anticipating giving my mum her chocolate hamper! Day -1 I can't wait to give my hubby his pocket watch, he loves them. Day -2 I love yule log but also partial to a mince pie or two. What are you going to watch over Christmas - Dr Who, Strictly, Eastenders, Emmerdale, Corrie! Day 3. I've earmarked The ABC Murders, love a good murder/mystery,The Midnight Gang but the one I'm most looking forward to is Luther! Day 3 - I don't really watch much TV, especially over Christmas, and this year I'll be overseas and it will all be in a foreign language anyway, so unless I can find BBC World News I don't suppose I will switch the TV on at all. Day 3 - Strictly and hopefully loads of good movies. I'm really looking forward to watching Zog on Christmas Day with my children. I'll also be watching the Grinch at some point. Day 3. What are you going to watch over Christmas? That is a hard question. I usually watch documentaries that I record. My husband will surely want to watch a couple of movies, but he will pick them out. 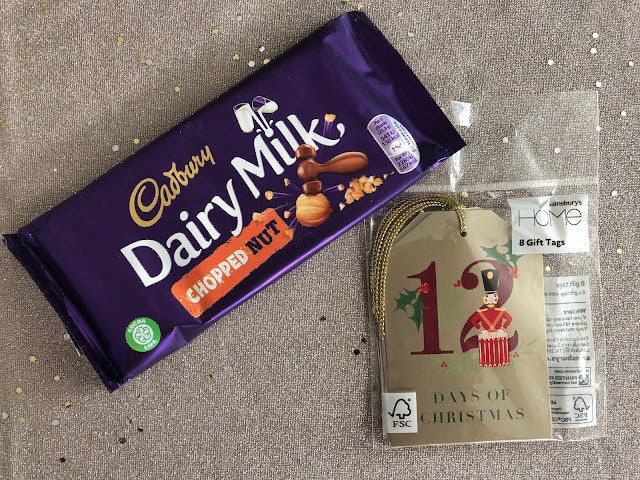 Day 1 - I never know what to give my elderly Mum and Dad, so for the last few weeks we have been buying bits and pieces of foodstuffs to make a hamper! Local honey, fancy biscuits and chocolates and the like that they would never normally buy! Can't wait to see their faces! 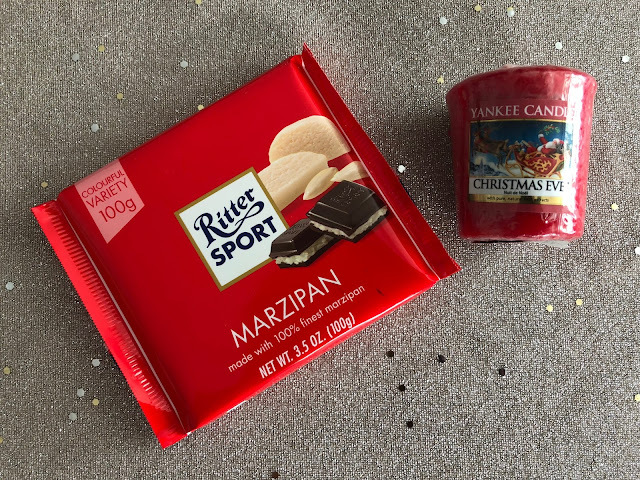 Day 2 - I love all the Christmas sweet things, especially if they have marzipan in them or on them! lol Also love Christmas Pudding and Mince Pies! Day 3 - we always watch The Snowman and The Grinch! Day 3: To be honest I haven't looked at the guide yet. I will probably watch the soaps - hopefully Eastenders won't be too morbid! Day 1 - I am most looking forward to giving my husband his present, some silver goblets. My favourite dessert for Christmas or any time is cheeseboard. I do like a mince pie though! I'll be watching Poirot and Dr who!! Day 3. Love Call the Midwife. I’ve watched every episode and this Christmas will be no different. Day 4 - I remember my Grandma having too much sherry one Christmas and deciding to sing (very badly) all her favourite Christmas songs. Day 4 - Hmmm funny memories? Well, when I was in infant school, I was an angel in the school nativity play and when my mum was ironing my costume, she managed to burn it with the iron. After washing it with a special product, mine ended up being the whitest costume on the stage that day ! Day 4 - there was the year my Great Aunt gave me a gift-wrapped tray of faggots. And didn't tell us it needed to be refrigerated. The smell coming from under the Christmas tree was pretty spectacular! I didn't find it funny at the time though, especially as I don't like faggots! Day 4: I have lots of funny stories for Christmas, as a dog owner (or dog mum). The first Christmas we've had with Festus was horrible, we only took him 3 days before Christmas (not as a gift! ), and he was a 3 months old puppy having fun with the cat and the tree filled with balls (or baubles as we call them). In the 2nd year though it was hugely different, as the dog though is his duty to guard the tree from the cat (he was keen on baubles too). So the tree was untouched, both of the were tired because they had to keep an eye on each other, and I was enjoying a quiet Christmas. Day 4 - Nothing that I can remember from adult days but I have plenty of amusing Christmas nativity videos from childhood! Day 4 - my cat pulled at the Christmas tree one year and it collapsed as we were having Christmas dinner! Day 4 - Our puppy's first Christmas she decided to open the presents I had wrapped (and put away in the bedroom) and pulled the pompoms off some slippers I had bought as a present. I think she was looking for her presents as I had tucked away a few of hers as well. Day 4 - My Nan used to sleep in our room on Christmas eve and she would keep us up chatting most of the time because she was so excited. One year she kept blowing off and she said it was every time she looked at the "happy eater" clock - we thought it was so funny at the time! Day 4 - Has to be the year our Golden Labrador decided to help himself to the leftover meat on the side and all the pigs in blankets whilst we went out for a walk after dinner! Day 4 - when I was little I desperately wanted the Crystal Maze board game. I opened what I thought was it but it was a candle making set and I burst into tears. I did get the game, it was just hidden. I actually got a lot of fun from making those candles! It’s amusing to me. When were little we spent one Christmas at my grandmas and we were worried that Santa wouldn’t know that we were away. My mum assured us he would and amazingly we got our presents ok! Day 4: When I was a little girl I used to sing, "Away in a manger, no crisps for a bed." Day 5 - Why does Santa have three gardens? So he can 'ho ho ho'! Please tell me your favourite terrible Christmas cracker joke. How will Brexit affect Christmas dinner? 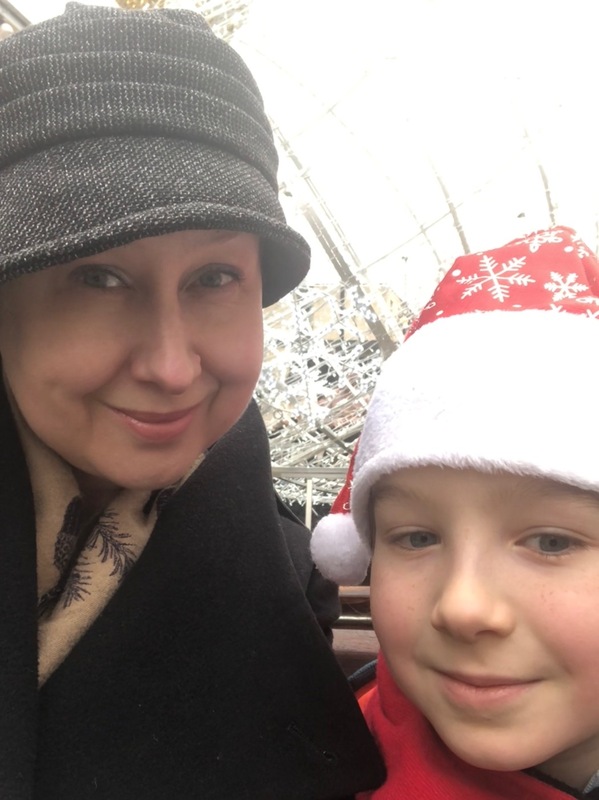 Day 5: How does Father Christmas find his way? By Santa-Nav. Day 5 - Christmas cracker joke. That is a hard question, I don't think I have a favourite one (as in I can't remember any). But I do enjoy reading them. Day 4 - I remember one year, when I was very young, my parents must have convinced me that I needed new bedroom furniture as my Christmas present! And that's what Santa brought me! Day 5 - Why did no-one bid for Rudolph & Blitzen on Ebay? Because they were two deer! Day 4 - when the midwife came to visit on Christmas day! FLynn was 5 days old and he's my youngest child, we also had my niece, the house was mayhem with 4 childrens toys and wrapping paper everywhere! Which reindeer can jump higher than a house? All of them! A house can't jump! Day 5: What does Santa do with fat elves? My most enduring memory of Christmas is being given a pair of socks from my brother when I bought him a pair of vans... won't spend more than £1 on him again lol!! What is the best Christmas present in the world? A broken drum, you just can't beat it! day5 What do you call Frosty the Snowman in May? A puddle! Day 4 - no funny or amusing memories related to Christmas that I can think of; sorry! why does santa have 3 gardens? so he can ho ho ho! Day 5 - What did the farmer get for Christmas ? - A cowculator! Day 5: What do Elves learn at school? The Elf-abet! Day 6 - I love Christmas jumpers and I'll definitely be wearing one this year. Christmas jumpers - do you love or loathe them? Will you be wearing one this Christmas? Love them (I have several) and, yes, I will be wearing one! Day 6: I've never had a Christmas jumper. Every year I say I'm going to get one and every year I don't get round to it. Maybe I should start knitting again and knit my own. I like the tasteful ones but I don't go out of my way to wear them. My children love wearing them on the run up to Christmas but we don't tend to wear them on Christmas day. Day 6 - I love Christmas jumpers. My husband and I started a new tradition a couple of years ago and we both have matching jumpers. Each year we buy new jumpers for Christmas, and we wear the ones we have from the previous years in the run up to Christmas. Day 6 - I'm not bothered. I bought one last year with stars on - not overly Christmassy, so I could wear it again at other times. Day 6 - I love them and have quite a few! I like Christmas jumpers with a bit of a twist, like my gothic skull with Santa hat one! day 6: I'm not really much of a fan of Christmas Jumpers, but I don't really have an aversion to them! Day 6: I don't mind them - I love penguins so any with penguins on are cute.